Digital Asset Management business scenario #11 in RSG's newly-updated roster of DAM vendor evaluation criteria covers periodicals and magazines that place a heavy emphasis on workflow, scheduling, coordination, and tracking. Typically, this process is managed externally to a DAM platform. To date, we haven’t seen deep integrations among these systems as you might need or expect. In some cases, the DAM system is an afterthought, where publication end-point system archives and indexes the final version. In an increasing number of cases, however, the DAM system plays an integral role in the workflow for storing the print publication and its in-process versions, including all the individual assets — photos, copy, advertising, layout documents, Word documents, and templates. We’ve seen a recent interest to produce for the Web, mobile, print using common assets expressed differently to the different media. The system should be able to transform photos from Web to print formats or vice versa, and now increasingly to mobile, tablets, and the like. Ideally you see some ability to round-trip to InDesign. The production of annual or customized publications has some unique needs. For example, Reptiles of the World might be an initial publication, whereas Reptiles of North America or Snakes of the United States would be narrower publications with much of the same content, copy, images, and assets. Producing weekly features or elements, such as the Sunday comic section, is another highly specialized form of production. From final approval, the system must prepare the element for syndication, distribute it to media outlets, and ultimately archive it. 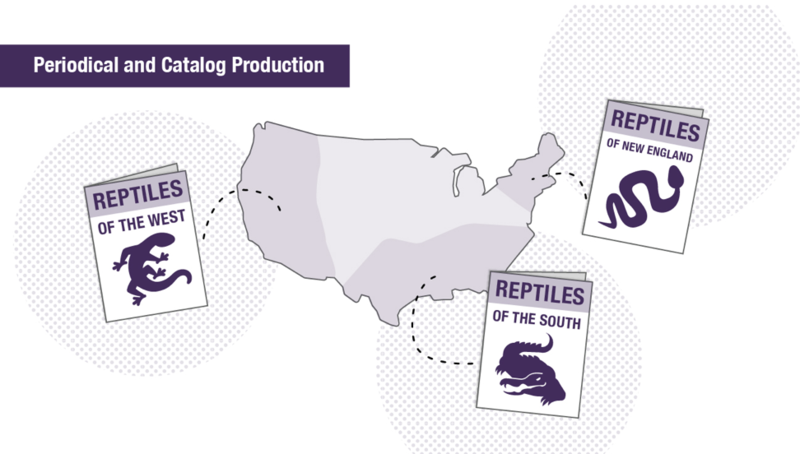 For enterprises that historically produced only a print catalog, now almost all of them develop identical print and online versions of the catalog (or store circular). Once again, integration with the Adobe suite can help smooth this process. The further the reach of the DAM system to these editorial and production workflows, the more important the conversation with the vendor is about its ability to integrate with the tools you need. For most enterprises, only a few of today’s DAM systems are cut out for what’s needed to serve this use case. Is the vendor your looking at a good fit for you? Ask an expert, we'd be happy to help you asses the large variety of products available.